Hadoop: What Is It, How Does It Work, And Why Use It? Wondering what is Hadoop? Or why use hadoop? We have this simple article that can describe hadoop and its features to help you understand Hadoop better. Hadoop, whose full name is Apache Hadoop, is an open-source framework primarily used in the processing and storage of big data. There are several reasons why every business that deals in big data needs software solutions like Hadoop, but before we go there, it is important to consider its characteristics. The term ‘Hadoop’ today also refers to the additional software (or ecosystem) that users can install alongside or on top of Hadoop, examples being Apache Pig, Apache HBase, Apache Hive, and Apache Spark. This article talk about the high level features and need of big data processing. If you need to do big data processing you may also like best hadoop book for beginners and hadoop questions to learn more in details about Hadoop platform. You may also want to explore hadoop use cases for scenario that are applicable to Hadoop use. To understand Hadoop best, you need to understand its features. Hadoop is the most popular big data analytics platform and many people think hadoop is the only option for big data analytics. However you may be surprised to know that there are many good alternatives to Hadoop. Though not all have a rich feature set like Apache hadoop does. Below are some key features of Apache hadoop that makes it leader in big data space. This is an open-source software program (as opposed to a commercial software program). This means the software is available free of charge and it is free to contribute to. It is, however, important to note there are several commercial Hadoop versions in the market today. Hadoop is basically a software framework. The term ‘Framework’ in this context means it is more than a program – it has everything needed not only to develop, but also to run the software application (such as connections and tool sets). Hadoop uses a distributed framework. The term ‘distribution’, in this context, means data is subdivided and stored is multiple computers. Computations sometimes take place in parallel across different connected machines. This distribution also means you will get very fast processing speed with Hadoop. HDFS (Hadoop Distributed File System) is the full name of this file system, which allows your organization to use different nodes to process thousands of TBs of data. Hadoop Common is responsible for providing OS and filesystem level abstractions. Hadoop Common also contains the utilities and libraries required by other models. Another Hadoop feature is Hadoop YARN. This resource-management solution manages resources needed in computing in clusters. This solution uses these clusters to schedule user applications. HadoopMapReduce is a cutting-edge programming model used by the framework for data processing. Every file system that is compatible with Hadoop provides location information, including the name of the network switch where a node is located. Hadoop applications can use this information for redundancy as well as to schedule work. Hoodop clusters have several worker nodes served by a single master. The master node serves as the TaskTracker, NameNode, JobTracker, and DataNode whereas the worker/slave node is a TaskTracker and DataNode. This means you can have worker nodes that only do computing tasks and worker nodes that only handle data. To run Hadoop, you need JRE (Java Runtime Environment) 1.6, or higher. You also need to set up SSH (Secure Shell) between the cluster and the nodes to run standard shutdown and startup scripts. Hadoop uses the FTP File system to store all the data on FTP servers that are remotely accessible. Clusters hosted on the on-demand Amazon Elastic Compute Cloud infrastructure usethe Amazon Simple Storage Service (S3) file system. However, note there is no rack-awareness with this option. The WASB (Windows Azure Storage Blobs) file system is an extension over and above HDFS that allows Hadoop distributions to get Azure blob store data with no requirement for permanent clusters. You will also find several 3rd party file system bridges used with Hadoop. In commercial Hadoop ships such as MapR and IBM, you will get alternative file system. I do not always recommend people to start using Hadoop or any similar distributed data analysis platform. Many of the large data problems can be solved with a traditional data analytics approaches. 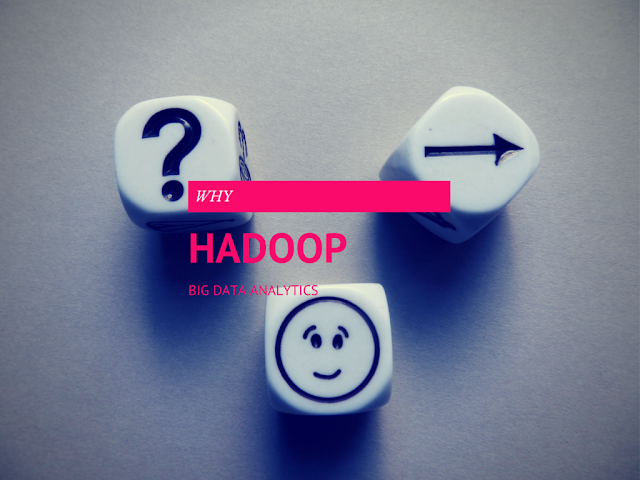 Wondering when to use Hadoop? It has many advantages over traditional relational database based approach to data analytics. Below are some key merits of hadoop that will convince you to use Hadoop if you surely have a big data problem. Hadoop gives you massive storage space. The framework is capable of storing massive data volumes. It achieves this by breaking down the data into blocks and then storing the data in clusters of cheaper hardware. This offers a cost effective solution for businesses that are having a challenge storing large data sets. With traditional relational DB systems, scaling to accommodate massive data volumes is very expensive since you would have to down-sample data and to do classification based on assumptions. You would then have to delete the raw data. The lack of availability of raw data with traditional relational DB systems meant you had to make compromises on the quality of your output. You could also not have an option to go back to old data in future. Hadoop offers you business unparalleled flexibility in that you have different data options (unstructured and structured). This allows you to derive the most appropriate information from emails, social media, clickstream data, and other sources of big data. Resilience to failure is another Hadoop benefit. When data is only stored in one node, there is a high risk of failure that could have devastating effects. With Hadoop, duplicate data is stored in other nodes within the cluster. The fact that big, successful organizations like Google, eBay, Twitter, Yahoo!, and Etsy are using Hadoop is proof that this is a good solution. Why Leave Hadoop Implementation To A Professional? The technology around Hadoop such as JRE (Java Runtime Environment), the different file systems in use and the features requires a trained and experienced person. It is unlikely that your team has the training and the experience necessary to do a good job. A professional will give you valuable tips such as on the best big data governance strategy. Do not risk your big data with an untrained hand because there is a big risk that it may get lost, become corrupt, or yield untrustworthy results. Hiring a professional for Hadoop implementation is important because the data you iterate will be much more believable compared to iteration done by an untrained person. Hiring a professional also eliminates the risk of ‘cooking’ of data by employees. When you hire a professional, this means you do not have to spend money on extra employees for the job. You will save money not only on salaries, but also on benefits. Many companies that have gone the outsourcing way have observed the cost benefits associated with outsourcing. You can hold an outsourced Hadoop implementation company liable should things go wrong, something that is much difficult with permanent and pensionable employees because of internal processes. Jenny Richards is a database and network administration specialist. She is of the opinion that companies like remotedba.com offer different data processing and storage solutions, but there are reasons why Hadoop is one of the most popular. Visit her blog to read more.